Corey Smale sat on a stool at the end of the bar and leaned forward as he bit into one of the rangoons that had just been delivered steaming from the kitchen. “The rangoon to me is like the best rangoon I’ve ever had,” he said in between munches while trying his best not to lose any crumbs. Smale, a University of Missouri–St. 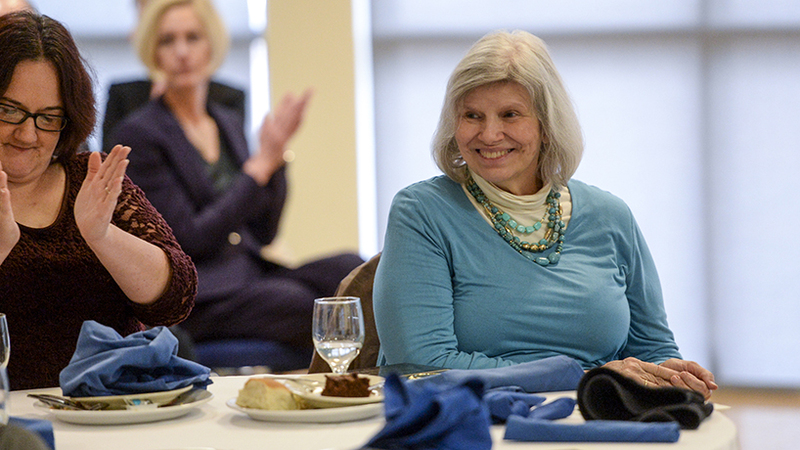 Louis communication alumnus, was eager to share the distinctive menu item – one made with salt cod instead of the traditional crab, in consideration of people with shellfish allergies, and served as a roll, not a wonton. 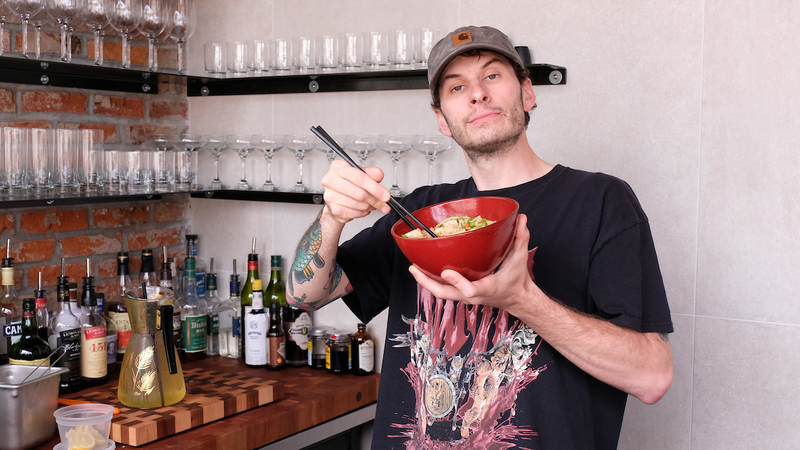 It had quickly become a popular appetizer at Smale’s new restaurant, Good Fortune – a New American Chinese concept that was two years in the making after his departure from Strange Donuts. Almost two months after its April opening, Smale was only then beginning to appreciate seeing his vision become reality. He took a leap in 2016 when he left behind the successful and still growing 3-year-old donut business – a concept he’d come up with in his Dogtown apartment while working at a local advertising agency. But Smale knew he wanted to do something different. 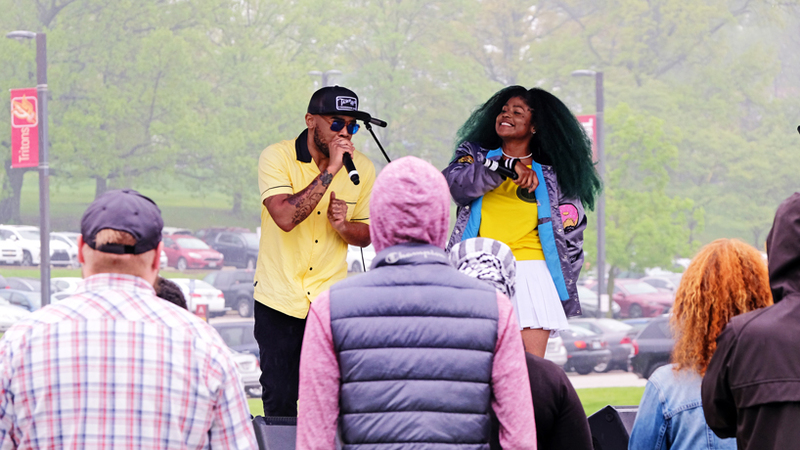 He said he and co-founder Jason Bockman – whom he met at UMSL through the International Business Club – had started to have different ideas about the direction of the business. 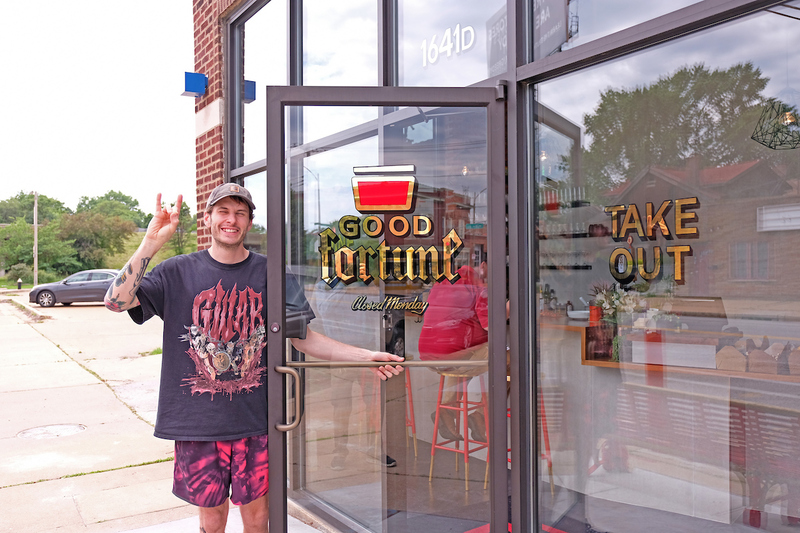 Corey Smale stands proudly at the entrance to Good Fortune on Tower Grove Avenue. The restaurant is located in a building owned by UMSL alumnus Ben Poremba, a restauranteur who owns Elaia, Olio and Nixta, near the same intersection with McRee Avenue. He’s always had a knack for marketing, coming up with creative ways to sell things going back to when he was a kid hawking WWF action figures. He thinks of his time playing in punk rock bands while in high school as a crash course in branding because it required him to create T-shirts and fliers and promote his group to get ahead. One summer when Smale was in college, he started a lawn care business called Lawn Ninjas. He and a friend dressed up like ninjas and mowed customers’ grass. He brought that creativity to bear from the start of Strange Donuts – which quickly stood out for its social media branding and unconventional flavors. He admits to having a lot to learn about running a business after leaving many of the operational decisions to Bockman. Smale said he solicited advice from friend Bob Brazell, owner of Byrd & Barrel among other culinary pursuits. Brazell introduced him to chef Ryan McDonald, who has become Smale’s partner with Good Fortune. Smale’s made mistakes along the way to seeing his idea through, such as announcing in 2016 in Feast Magazine that the restaurant would be opening at a location in the Central West End. Never mind that he’d not yet signed a lease. For a time, he explored buying a building along Tower Grove Avenue in the Botanical Heights neighborhood. He established a friendship with UMSL philosophy alumnus-turned-restaurateur Ben Poremba, who’s won acclaim for a growing list of restaurants, including Elaia, Olio and Nixta, all near the same corner of Tower Grove and McRee Avenue. Poremba was purchasing a building across the street from Olio when Smale abandoned his bid for the other property. Poremba suggested he instead lease a space in Poremba’s building. They finalized the deal last August on the day of the eclipse. “To be real, it elevated our concept in the sense that it’s like, ‘Well, you’re going to be around a bunch of really good restaurants, so you guys better be pretty good,’” Smale said. More goes into designing a restaurant, specifically its kitchen, than a donut shop. Even after signing a lease, it still took months for construction of Good Fortune to be completed. Smale said he, McDonald and some of their staff traveled to Los Angeles and New York last fall and winter to put on pop-up restaurants – one with Delicious Pizza, the restaurant in South Central Los Angeles owned in part by hip-hop record label Delicious Vinyl founder Mike Ross and brother Rick Ross. The pop-up was called “Good Pizza, Delicious Fortune.” McDonald created a kung pao pizza for the event. Those helped Smale and his team keep up their enthusiasm through the waiting. They then endured a crazy two months as the final details were ironed out ahead of the April 13 opening. “I don’t think I was ever going to give up,” said Smale, though he acknowledged living through some dark moments while seeing Good Fortune to fruition. 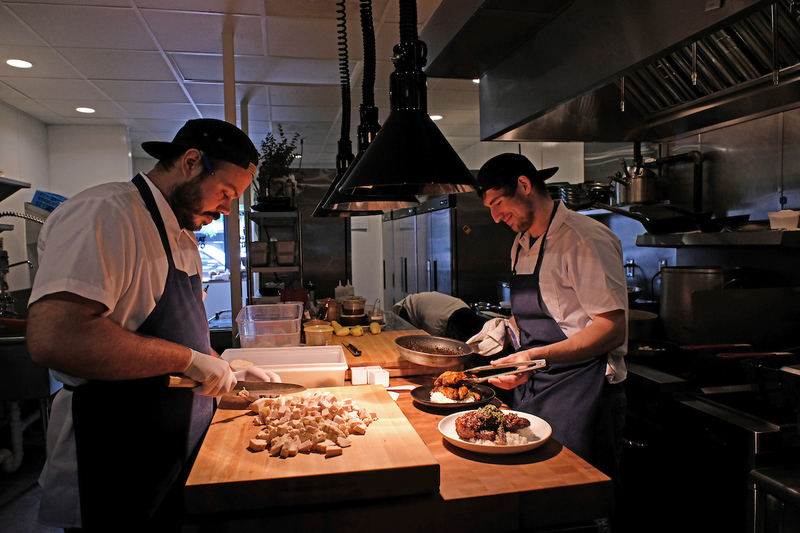 Chef Ryan McDonald (at left) and sous chef Matt Wynn work in the kitchen at Good Fortune. Wynn is plating an order of Kung Pao Fried Chicken. Six days after the restaurant opened, he found himself in the emergency room after experiencing chest pains and wondering if he was having a heart attack. Smale swims regularly and eats well, and his EKG test came back clear, but stress had been taking a toll. The episode did prompt him to change some habits and begin meeting with a counselor, both of which have helped him begin to appreciate the restaurant’s early success. It has been met with some positive early press. 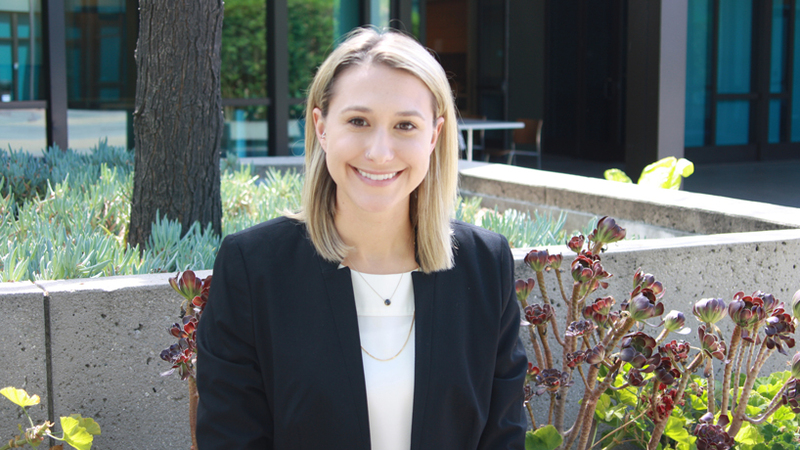 The business has continued to evolve with the addition of a $10 takeout menu that Smale believes has helped reach an even wider audience. Smale has already started contemplating future projects, including putting his marketing skills to use as a consultant, helping other entrepreneurs find success. But he’s equally excited about Good Fortune’s future.